Mediation is used in a range of ways where workplace bullying is an issue. However the forms of mediation vary extensively and can be partly determined by the culture of a particular workplace as well as whether a dispute has escalated to the Fair Work Commission or has been categorised as a workers compensation dispute. In 2014, changes were made to introduce focused anti-bullying approaches in the Fair Work Commission. This article considers those approaches in the context of the timing of mediation in relation to workplace bullying. In addition, the skills and process used in early workplace mediation are considered in the context of case studies involving varying workplace mediation approaches. Factors that influence the approach used by mediators include factors relating to mediator training, the type of dispute, the power imbalance (if any) between the participants, and the purpose of the mediation itself (ie, whether the mediation is directed at settling a dispute or whether it is directed at serving a triage or other function). Specifically, this article explores the use of mediation in relation to workplace bullying as an earlier triage tool (as well as a potential dispute finalisation tool) and considers the approaches that mediators might use in relation to early intervention mediation. Regardless of the legal or other pathways chosen to address a bullying dispute, it is commonplace for (alternative) dispute-resolution (ADR) techniques, such as mediation, to be a part of the resolution process. ADR comes with a range of possible costs and deficiencies including concerns that justice is not necessarily always done, despite ADR’s claimed “success” from the perspectives of some ADR practitioners, lawyers, and the systems within which they work. 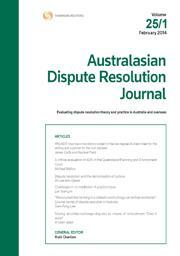 In this article, we look at the suitability of ADR for workplace bullying disputes. As is the case with ADR in family and domestic violence matters, there are also issues concerning power imbalances between the parties in bullying cases. In addition, we examine the possible consequences of “off-the-record” ADR settlements on the Australian legal system – case law and precedent, and the community as a whole, We consider the answers to these questions through critical analysis, which is complemented by our experiential knowledge. Lastly, we make conclusions and recommendations for improved and fairer dispute resolution processes and better settlement outcomes. This article discusses property settlements and spousal maintenance for the elderly. The property and spousal maintenance basics are built on the four-step process approach which deals with financial matters in relationships between elderly persons. Under the Family Law Act 1975 (Cth) there are the matters of financial and non-financial contributions addressed in s 79, future needs considerations under s 75, right to spousal maintenance under s 72 and the powers of the court under s 74 with considerations discussed for implications for short subsequent marriages. Capacity is the threshold question for determining the need for and appointment of a case guardian, administrator or adult guardian for a person with impaired decision-making capacity. In cases where an elderly person’s capacity is deemed to be impaired, alternative dispute resolution can become limited. When an elderly person’s capacity is impaired it may be necessary to open litigation as a pathway when they have been subject to abuse, neglect or exploitation that is typically known as elder abuse. Teachers of mediation skills have often relied on videos to demonstrate mediation skills to prepare for role-plays. However, merely watching a video may not be as effective as also engaging with peers. The watching of video, combined with a subsequent online discussion of mediation skills, can enhance student learning as students become active rather than passive learners. After watching videos and discussing the mediation skills online, students can later be asked to demonstrate these skills in role plays. This article discusses an example of the use of video and online discussion to scaffold learning about mediation. Students watch a video of a mediation, discuss the mediator interventions online and then undertake role plays at an intensive weekend seminar. The scaffolding of student learning through watching the video and subsequent online discussion prepares students to demonstrate the mediation skills. The article concludes with a model of ADR learning with video that serves as a useful guide to implementing active video learning activities. Almost 40 years ago, mediation was kick started in Australia by the establishment of a pilot program conducted by the New South Wales Community Justice Centre. This article canvasses the author’s first 10 years with the CJC, the mediation process that was followed and cases that stuck in the memory. A review of other organisations active in mediation in that time is noted. The article concludes with the belief that the initial excitement continues to this day. For the PDF version of the table of contents, click here: ADRJ Vol 29 No 3 Contents.